...the place to start in becoming a Home Inspector. step-by-step guide for starting up and operating a successful Home Inspection business." Hundreds of Home Inspectors have used this groundbreaking home inspection system to successfully start and operate their businesses --- and YOU CAN, TOO. you need to start your training with this guidebook. This guidebook, titled "BECOME A HOME INSPECTOR!" is an 8.5 x 11 inch, 156-page business manual that shows you all of the details on how to startup and operate a successful home inspection business. With over 30,000 copies sold, this is ONE OF THE TOP SELLING HOME INSPECTION TRAINING BOOKS OF ALL TIME. Before you spend $400 or $800 or $1,000 on a home inspection training course, it's wise to know as much as you can UP FRONT about conducting a home inspection and running a home inspection business. This specialized "HOW TO" manual focuses on a no-nonsense approach to becoming a Home Inspector and operating your home inspection business EFFECTIVELY and EFFICIENTLY. It also answers many of the tough questions that all new inspectors have. Detailed step-by-step procedures for getting ready for an inspection. Detailed step-by-step procedures for conducting an inspection. Detailed step-by-step procedures for filling out your inspection report. Detailed step-by-step procedures for presenting your results to your customer. What inspection equipment you really need. How to find out if your state requires a license. "Tricks of the trade" provided throughout. Answers to questions on insurance, accounting, and record keeping. What equipment you need for a home office. Using your existing vehicle for this business. How to price your services. How to conduct an efficient inspection. How to report (and how NOT to report) findings. How to market and advertise. How to deal with clients, sellers, and realtors. How to REALLY make $500 to $900 per day, full OR part-time. of this page to receive FREE SAMPLE PAGES from this manual. "I found your book informative......and pretty much the bible of the home inspection business......Great job!" "Your advice was a very important catalyst in the success of my business...... I hit the ground running and have never looked back...... I average 12 inspections each week......Thank you for giving me a "tool" that was well worth the pennies it cost." "I'm an ICBO Certified Inspector...Your book is so complete and straight to the point that it is going to make the transition almost easy...... I keep looking back through the book and it always answers my questions...... Some I didn't have a clue about...Thanks again!!!" "Your book is excellent!......We're so glad we found your site......Thank you so much for all your hard work and willingness to share your knowledge with others." "Very informative......Easy to read and understand......I now feel more comfortable and confident to get started." "Your book is incredible......A wonderful tool and full of understandable examples......Thanks for writing it." "Just wanted to say the book is very helpful......I'm looking forward to starting a home inspection business in my area." "The book really digs into the nuts and bolts of the business......and gives me more confidence that this is the field for me to pursue......Thanks again for an informative, practical 'how to' book." "For someone like me who is researching about becoming a home inspector, the book is a great resource and worth every penny...... it gave me a lot to think about and answered many questions that I had...... Thank you!" "The book is very interesting and informative.....It is just what we were looking for.....We are anxious to get started!" Isn't it time YOU got started? 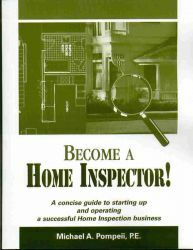 If you are thinking about becoming a Home Inspector, then the home inspection business and home inspector training manual "BECOME A HOME INSPECTOR!" is where you need to start ! You can now purchase "BECOME A HOME INSPECTOR!" for only $29 plus shipping. The Home Inspection Business and Training Manual "BECOME A HOME INSPECTOR!" will be shipped within 24 hours of your order via USPS Mail for $29 plus shipping. We accept most major credit cards or PayPal. Click the Buy Now button to order. If you would prefer to send a check or money order through the mail, please click here. GUARANTEE: If you're not completely satisfied with "Become A Home Inspector! ", for any reason, I will refund your money within 2 weeks of your purchase. It's that simple. I am so convinced that you will be delighted with this home inspector and home inspection business manual, I'm giving you a full 2 weeks to decide! P.S. The purchase price of this manual is TAX DEDUCTIBLE as a business expense. ORDER NOW and BECOME A HOME INSPECTOR ! that saves both time and money for Home Inspectors. A concise guide to successfully subcontracting and building your own new home. Use the process in this do-it-yourself manual to save thousands of dollars on your new home. Become A Home Inspector - A Home inspection business and home inspector training manual.